Member States have enacted laws, or are preparing to do so, to provide the necessary regulation for food markets within their jurisdiction. The decisions they have made in shaping their laws, and the balance they have struck between consumer information and the food business operators’ desire for flexibility, are the focus of this book. Specialized lawyers of the Food Lawyers’ Network have pooled their knowledge in this volume to provide an account of the measures taken, showing the level of discretion national regulators retain in the area of food information, within what is a highly integrated regulatory environment of the European Union. Green claims for food products are used to advertise specific efforts of food businesses to protect the environment, the well-being of animals, and enhance fair trade. Green labeling has emerged in many countries, even though in most countries national legislation or specific regulations for such claims are still lacking. However, green claims on food products constitute food information and have to comply with the general food law principle not to mislead the consumer. 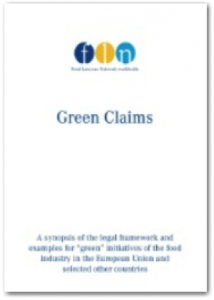 This synopsis compiles country reports from Members of the Food Lawyers Network Worldwide on the legal framework for green labeling in their own country. In addition, examples and experiences are gathered of food industry initiatives on how to highlight ecological achievements. Consumer demand for foods with specific health benefits has increased the economic importance of developing, producing and marketing functional food. However, within the European Union, this area of food law is harmonized only to a minor extent. Therefore, the economic operators face the difficulty of having to comply with national laws that might differ substantially from one Member State to another. 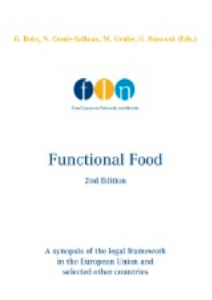 This synopsis is aimed at facilitating the first approach to legal framework of functional food within the European Union and selected other countries.